If you're looking to own a powerful ride to conquer the streets whether you're in the city or outside on an off-road adventure, then you'll want to be driving the 2016 Nissan Armada. This full-size SUV is perfect for carrying the whole family or cargo to your destination. The Nissan Armada has been revamped to be a thrilling ride that all drivers will enjoy! At Premier Nissan of Metairie, you'll have the opportunity to purchase the 2016 Nissan Armada for an amazing price. Premier Nissan of Metairie is located at 6636 Veterans Memorial Blvd. in Metairie, LA and serves the following cities: New Orleans, Gretna, Laplace, Mandeville, and Harvey, LA. 2016 Nissan Armada has a starting MSRP of $38,410. The MPG rating on the Armada is 13 city / 19 hwy. 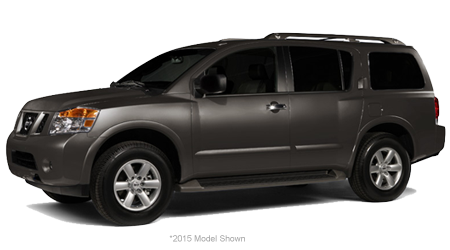 The 2016 Nissan Armada is a fantastic SUV that is loaded with a plethora of features and amenities you'll love. From the moment you step inside to the moment you leave, you'll grip the steering wheel hard as you zip through traffic and the open road. There are four models to select from: SV, SL, Platinum, and Platinum with Platinum Reserve package. Exterior colors include arctic blue metallic, brilliant silver, espresso black, gun metallic, java metallic, magnetic black, midnight garnet, and pearl white. The interior color has a choice between charcoal or almond cloth. The 2016 Nissan Armada comes equipped with a 317HP 5.6L V8 engine. Features include 18" aluminum-alloy wheels, full-size spare tire, oil pan skid plate and splash guards, automatic on/off headlights, painted roof rails, running boards, body-color grille, dual power heated outside mirrors, rear sonar system, flip-up liftgate window front UV-reducing solar glass, and rear black privacy glass. Interior features on the 2016 Nissan Armada include a 7" color monitor, Bluetooth, rear air conditioning with rear controls, power adjustable pedals, power windows with front one-touch auto up/down, flip-out third-row windows, power door locks with auto-locking feature, remote keyless entry with remote front windows down, key-operated front windows,, cruise control with illuminated steering wheel-mounted controls, tilt steering column, variable intermittent speed-sensitive windshield wipers, Intermittent rear window wiper, dual front map lights, dual 2nd/3rd row reading lights, four 12-volt DC power outlets, digital clock, temperature gauge, sun visors with illuminated vanity mirrors and extensions, lockable glove compartment ten cup holders, and cargo tie-down hooks. The trim on the 2016 Nissan Armada 8-way power driver's seat with power lumbar support, 4-way power front passenger's seat, 2nd-row 40/20/40 split, fold-flat bench seat with tip-up, 3rd row 60/40 split fold-flat bench seat, cloth seat trim, leather-wrapped steering wheel, and leather-wrapped shift knob. When you purchase a premium 2016 Nissan Armada, you're purchasing more power, luxury, and efficiency. Standard features include 20" wheels fog lights, painted roof rails, roof-rack crossbars, Body-color front door handles, dark chrome grille, side molding inserts and outside mirrors, chrome exhaust tip finisher, dual power folding heated outside mirrors with puddle lamps and turn signals, auto-dimming driver-side outside mirror, front/rear sonar system, power liftgate, tow receiver hitch, seven-pin wiring harness, and trailer brake pre-wiring. Interior features of the premium models include Nissan Intelligent Key keyless entry and ignition system, 7" VGA touch-screen monitor with voice recognition and navigation, Bluetooth, in-cabin micro filter, HomeLink universal transceiver, rearview monitor, power flip-out 3rd row windows, footwell lights, auto-dimming rearview mirror, and lockable front center console with padded armrest cup holder lid for center console. These extra features added on make the premium models a worthy SUV. Standard safety features in the 2016 Nissan Armada include Nissan advanced air bag system with dual-stage supplemental airbags, driver and front passenger front/side airbags, roof-mounted curtain side-impact supplemental airbags, vehicle dynamic control with traction control system, blind spot warning, rear cross traffic alert, optional predictive forward collision warning, optional forward emergency braking, 3-point ALR/ELR seat belt system, front seat belts with pretensions and load limiters, lower anchors and tethers for children, zone body construction with front/rear crumple zones, hood buckling creases and safety stops, Pipe-style steel side-door guard beams energy-absorbing steering column, and a tire pressure monitoring system with easy-fill tire alert. You can count on Nissan for having amazing safety measures on their cars! When it comes to the king of all SUV vehicles, the 2016 Nissan Armada is a powerhouse vehicle you'll love. Come to Premier Nissan of Metairie for an amazing selection of cars and an enjoyable experience! Premier Nissan of Metairie is located at 6636 Veterans Memorial Blvd. in Metairie, LA and serves the following cities: New Orleans, Gretna, Laplace, Mandeville, and Harvey, LA.